With a record of 21-2 against Andy Roddick, Roger Federer who has been in superb form this season should have taken care of his rival in the third round. 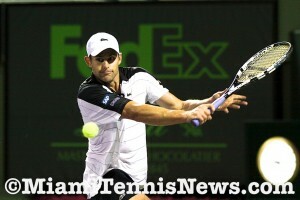 Instead, Roddick upended Federer 7-6,1-6,6-4 to advance to the fourth round at the Sony Ericsson Open. The last time Roddick was victorious over Federer was a night session also at the Miami Masters in 2008. Since then, Federer has won their six meetings including a heartbreaker in the final of Wimbledon in 2009. In the third game of the opening set, Federer had double break point. But, Roddick did not flinch and eventually held. 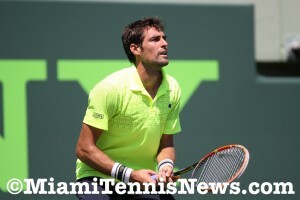 With no further break chances for either player, the first set went to a tiebreaker. Despite a 10-2 record against his second round counterpart, Roger Federer is acutely aware that Radek Stepanek can be a dangerous player. However, from the outset, Federer was in full control of the match. 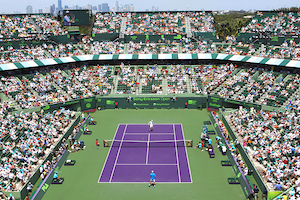 Federer vanquished Stepanek 6-3, 6-3 to move on to the third round at the Sony Ericsson Open. At love, Federer broke to go ahead 4-3. Federer sustained the cushion all the way through to seal the first set. His first time out serving in the second set, Federer stared at break point in the second game. Yet, the world number three wiped that out in a hurry. Subsequently, Federer obtained the break in the third game. Thereafter, Federer was supreme breaking Stepanek one last time as he served to extend the match. Federer has been a fixture on the tour for over a decade. It seems every time he steps on court there’s another record he is equalizing or shattering. With the victory this afternoon, Federer knotted Pete Sampras with 762 wins.